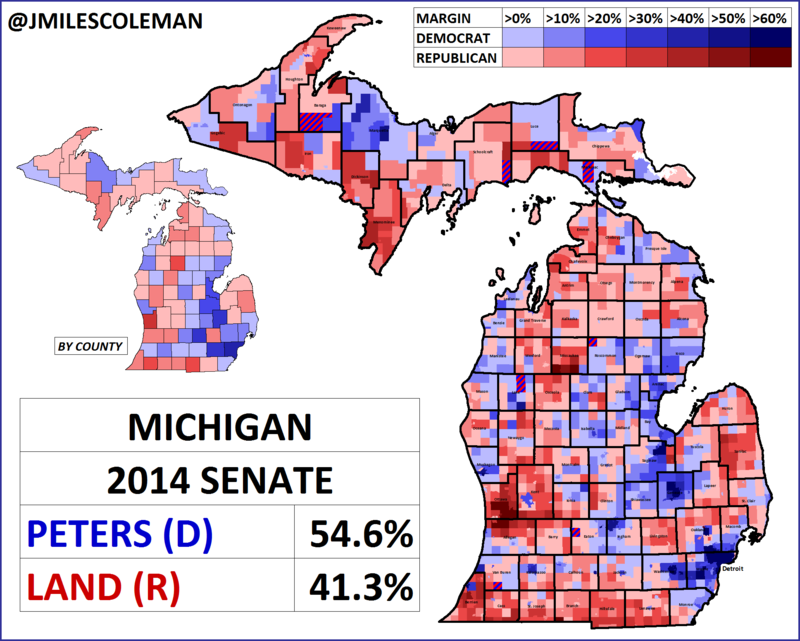 Continuing our look at Michigan, while the Democrats won the open Gubernatorial race there by a comfortable 10% last year, the Senatorial result was something better for Republicans. Senator Debbie Stabenow (D) was initially elected to the chamber in 2000, after representing a swingy Lansing-area seat in the House. She was reelected by increasingly large margins in 2006 and 2012, while rising to leadership. Seeking a fourth term in 2018, she had name recognition as well as a favorable national environment on her side. 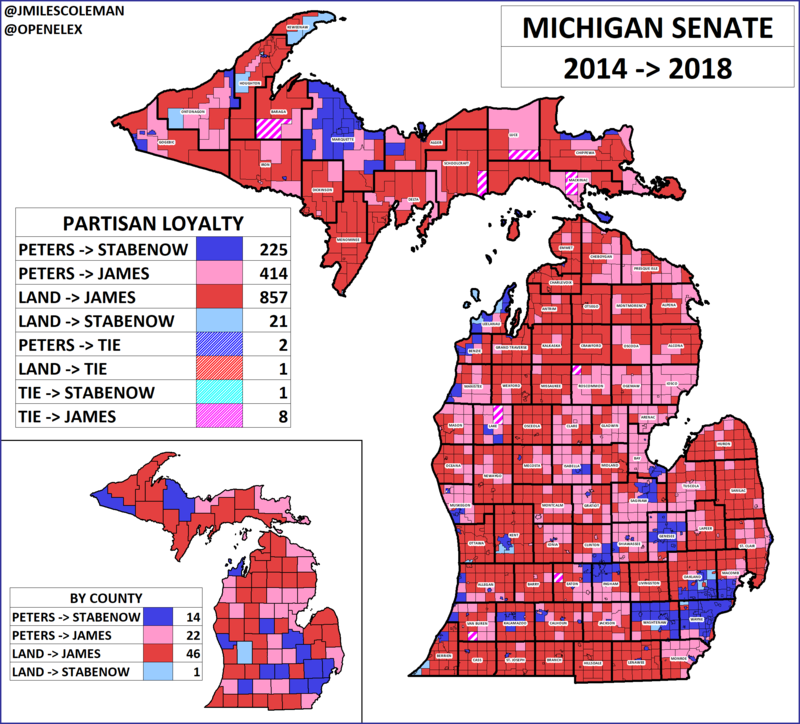 Like Trump two years earlier, James painted much of the state’s geographic area red, though Stabenow’s strength in the metro Detroit area kept the state blue. A 6.5% win may seem like a decent margin for Democrats, considering the President narrowly carried Michigan in 2016, but in the broader context of Stabenow’s career, she’s had much better results. Before 2018, Stabenow’s last race was in 2012, when she ran far ahead of the top of the ticket. That year, President Obama carried the state by 9.5%; she more than doubled that, posting 21% margin as she was reelected 59/38. Her opponent in 2012 was ex-Rep. Pete Hoekstra (R). Though Hoesktra’s candidacy never recovered from a racist ad that backfired early in the cycle, he had a base in western Michigan. Going into the election, Stabenow led by double-digits in most polls, as the race had essentially fallen off the board months earlier. Not surprisingly, the red swing was most acute in northern Michigan; as national trends solidified, Stabenow became more of a generic Democrat, which diminished any personal appeal she had in Trump-friendly areas. Bay County, a mid-size county, is a good example of this; it gave her 60.6% in 2012, while she narrowly lost it in 2018. Huron County, which makes up the tip of the Thumb, was a more extreme case, going from 60.2% Stabenow in 2012 to 60.8% James last year. Both Bay and Huron counties went to Trump by double-digits. 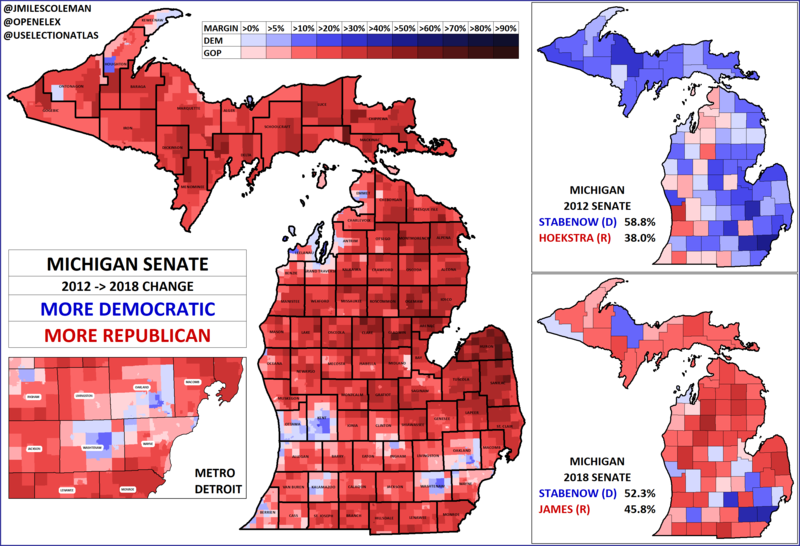 As with other state Democrats in 2018, Stabenow improved in Kent County (Grand Rapids), as well as several suburban townships throughout metro Detroit. In fact, she did almost as well in suburban Oakland County (taking 56.1%) as she did in Genesee County (57.0%), which houses Flint and is a more historic pillar of the Democratic coalition. As much of the rural blue shows, Peters was competitive in areas that would move heavily to Trump just two years later. Still, Peters remains fairly anonymous, especially since he lacks the seniority and name recognition Stabenow had. Further, Democrats’ 2018 wins in Michigan were due in large part to their dominance with educated and wealthier votes – groups who vote more consistently in midterms. In a Presidential year, the electorate seems likely to take on a more blue collar character, as lower propensity voters show up. This last map looks at the towns that changed hands between the 2014 and 2018 Senate races. In 2018, Stabenow won by half the overall margin Peters did in 2014 (6.5% vs 13.3%), but she lost over 400 towns that he carried. Michigan will be an interesting Senate race to watch in 2020, especially as it’s one of the relatively few states where Democrats will be defending an incumbent. The Democrats made gains in metro areas throughout the state in 2018, but if Trump puts up crushing margins in the rural areas again, the state will be competitive. Overall, a big question will be how much blue collar support Peters can retain from 2014, especially considering the inroads James made in rural Michigan last year. Peters starts out favored, but Michigan will be one of the GOP’s best Senate pickup opportunities in 2020.